The sad little monkey are here again, it's like them never learn the lesson. You need to find all the hidden professional ninja monkeys who are hiding in some very strange places, there are thirty ninjas in each stage need you to find and there can be quite some effort for some of them are hiding on places you will never think before, use you mouse to tap on the suspicious places and find if there are something you are looking for, and solve some puzzle as well bes of luck. You can play Monkey Go Happy Ninja Hunt free online shooting games at fogames. It has tags: Puzzle,Monkey,Ninja,Point and Click. It has 2525 total plays and has been rated 81% (9 like and 4 dislike), find the fun and happy day. If you want to play more shooting games, we find some of the game: Monkey Go Happy: Ninja Hunt 2, Monkey Go Happy Tales 2, Monkey Go Happy Candy and Monkey Go Happy Tales. To play other games, go to the puzzle games page, the monkey games page, or just check out the new games or best games page. 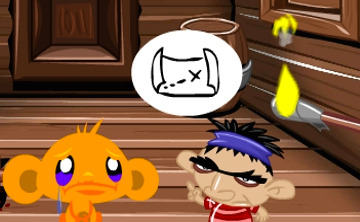 Play Monkey Go Happy Ninja Hunt online games, Fun and Happy.